So you’re wandering through the forest and come across this gigantic mountain of a man who has a peculiarly high voice and he asks you to get a shrubbery for him. Why? He won’t say. But he needs it. Or else he’ll punish you. And how does he punish you? By saying “Ni.” You’re skeptical at first, yes, but then they actually say it. It pierces your ears and rings in your head like a bat frantically trying to get out of a box. Blood trickles from your ear as he continues yelling “Ni!” and you fall to your knees. “OKAY!! I’LL DO IT!” you say, “I’LL GET YOUR SHRUBBERY!” You run away and as soon as you get out of earshot, you calm down. And you keep calm. 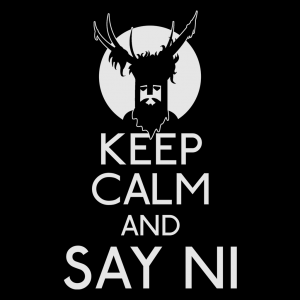 And say Ni.